Image registration (or alignment) is a useful preprocessing tool for assisting in manual data extraction from handwritten forms, as well as for preparing documents for batch OCR of specific page regions. 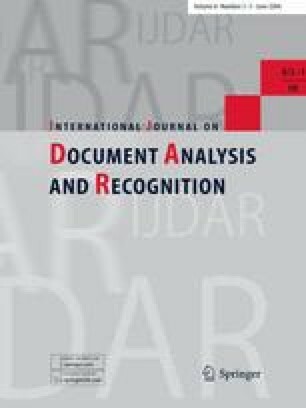 A new technique is presented for fast registration of lined tabular document images in the presence of a global affine transformation, using the Discrete Fourier--Mellin Transform (DFMT). Each component of the affine transform is handled separately, which dramatically reduces the total parameter space of the problem. This method is robust and deals with all components of the affine transform in a uniform way by working in the frequency domain. The DFMT is extended to handle shear, which can approximate a small amount of perspective distortion. In order to limit registration to foreground pixels only, and to eliminate Fourier edge effects, a novel, locally adaptive foreground-background segmentation algorithm is introduced, based on the median filter, which eliminates the need for Blackman windowing as usually required by DFMT image registration. A novel information-theoretic optimization of the median filter is presented. An original method is demonstrated for automatically obtaining blank document templates from a set of registered document images.